Day by day, the European Commission consults with more than 30,000 experts that convene in about 1,000 expert groups. I argue that in order to understand the ubiquity of expert groups we need to look at how and why the European Commission uses its expert groups in the policy process. In my new book ‘The European Commission, Expert Groups, and the Policy Process: Demystifying Technocratic Governance’ (Basingstoke: Palgrave Macmillan 2015) I show that expert groups are important for the Commission, because they not only solve technical problems, but also function as political devices and negotiators in EU policy making. The European Commission is at the center of the European Union’s (EU) political system. With its quasi-monopoly on the initiation of legislation it strongly influences the rules that govern the daily lives of European citizens. When drafting European legislation the European Commission consults regularly with about 1,000 expert groups. These Commission expert groups are part of the EU committee system, which is largely regarded as the embodiment of EU technocracy. As a potential bias towards technocracy is feared to decrease political or democratic considerations in the EU policy process, the Commission’s ‘technocratic shadow administration’ in Brussels has come under increased public attack. Case studies have pointed to the influential role of expert groups on the Commission’s policy proposals. Publicly, critical voices, such as the non-governmental organization ALTER-EU, have portrayed the European Commission as a ‘captive’ of industry-dominated expert groups. Also the European Parliament has repeatedly criticized an imbalanced composition of expert groups and a lack of transparency in their work. In 2011 and 2014 the European Parliament set a budget reserve on the Commission’s budget for expert groups, which was conditional to a series of reforms by the Commission, such as strengthening balanced representation of different interests in expert groups, addressing conflicts of interest of participants, and ensuring transparency in the work of expert groups. Thus, in the public debate Commission expert groups are increasingly seen as far more than technocratic deliberation arenas or impartial providers of factual data. However, we lack systematic insights into the Commission’s daily work with its expert groups. 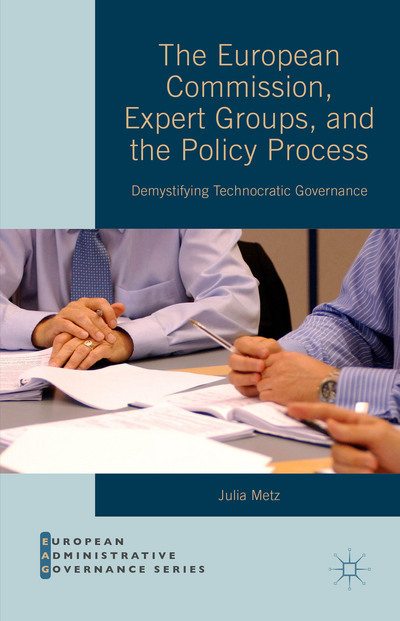 This book challenges the myth that Commission expert groups are purely technocratic bodies by asking: How does the European Commission use its expert groups in the policy process? And, which factors explain variation in the Commission’s usage of expert groups? In my book I argue that if we want to understand the role of expert groups in the policy process, it is essential to investigate the motivations of the formal institution that consults these bodies. I therefore focus on the European Commission’s reasons for consulting expert groups and on how the Commission’s Directorates-General use these committees in the EU policy process. More concretely, I assume that the European Commission consults with expert groups because it depends on its environment for resources it needs when preparing legislative initiatives – and expert group can provide these resources. Thus, a resource exchange between the Commission and its expert groups takes place. Following this idea, I develop a typology of expert-group use, which is based on the most important resource that expert groups provide. A problem-solving use of expert groups is most important for a technocratically motivated Commission engaged in finding efficient solutions to problems. It refers to instances in which the European Commission acquires expertise and information from its expert committees. In these cases, expert groups can be seen as a means for the Commission to manage its internal lack of expertise when addressing complex policy problems. The Commission uses expertise ‘cognitively’ (Dreger, 2014) or ‘instrumentally’ to solve policy problems (see also Boswell, 2009; Rimkuté and Haverland, 2015). A substantiating use occurs when the European Commission involves expert groups to acquire and signal support for its preferred policy positions. In these cases, expert groups are used ‘argumentatively’ (Dreger, 2014) to justify the Commission’s policy choices against other actors. As opposed to the problem-solving use, the Commission’s focus lies not on efficient problem solving, but on maximizing its gains and on the preferences of other actors. Here, policy proposals are not based on efficiency concerns, rather reflect the will of powerful actors. The Commission is predominantly concerned about the positions of veto players in the European decision-making process – thus, the Council and European Parliament. In the case of a consensus-building use, committees are not valued for their informative or supportive expertise, but for their institutional framework. In expert groups, relevant actors can meet, exchange (contradicting) views, and reach agreements. Here, expert groups are not seen as arenas for expertise, but as assemblies that broker out compromises, with the Commission demanding ‘consensual positions’ from its committees. Similar to the substantiating use, here the Commission’s focus is directed towards the political feasibility of policy solutions rather than towards their technical efficiency or effectiveness. The book shows that the Commission’s administration draws heavily on expert groups when preparing legislation and indeed uses them for multiple purposes. This finding is visible in various empirical analyses. First, the book provides a quantitative overview of the Commission’s expert group system, including a network analysis, which is based on data from the Commission’s online expert group register. Here I identify patterns that indicate that not only technocratic concerns seem to motivate the European Commission when working with expert groups. The analyses further show that Commission expert groups are not all alike, rather vary substantially in their institutional frameworks. The main part of the book discusses four expert groups in the area of research and innovation policy and their role when preparing policy initiatives. These insights are then compared to the Commission’s use of expert groups across three policy areas – research and innovation, the intersection of social and internal market policy, and consumer policy. This cross-sectoral analysis uses data from a multi-annual collaborative research project on ‘Position formation in the EU Commission’ conducted at the WZB Social Science Centre Berlin, which traces the Commission’s drafting processes of 48 legislative proposals from 1999 to 2009 (Hartlapp et al., 2014). The analyses reveal that the European Commission worked intensively with expert groups across all three policy areas: in almost three quarter of the policy processes the responsible Directorates-General consulted expert groups. In addition to expert groups, the Commission services also used various other consultation channels. The book therefore shows that, rather than merely working as a technocratic institution in isolation, the European Commission responds to political demands and developments in its environment, and uses expert groups to help to manage its dependencies. Thereby, a political mode of expert-group usage – subsuming the substantiating and the consensus-building uses – occurred just as often in the Commission as a technocratic mode. In addition, routinized behavior and traditions developed over time guide the Commission in its consultation of expert groups: the Commission’s Directorates-General displayed distinct patterns and preferences regarding the way they manage their resource dependencies with their environment and work with expert groups. While some Commission services examined in the book worked closely together with expert groups across various types of initiatives or policy areas, others did so more selectively. DG Research, for example, involved a whole battery of expert groups across several initiatives under its responsibility, while the DG for Information Society used expert groups more selectively. Finally, while conceptually three ideal types of expert group use were constructed, empirically I found a multimodal use of expert groups. In most cases, a Directorate-General used its expert group not only in one, but in several different ways when preparing an initiative. My study can account for a multimodal use by showing that within one drafting process, several resources can be critical for the Commission, which therefore uses its expert groups in various ways. For example, while technical expertise was needed at the beginning, substantiating expertise was often needed towards the end of a process to support the Commission’s proposals against opposition in the Council and European Parliament. Thus, when the Commission’s Directorates-General consult expert groups, they are anything but driven only by technocratic concerns (i.e., the quest for specialized knowledge), rather are also guided by political motives. Often, Commission services also anticipate political decision making in the Council and European Parliament and are aware of the political implications of their decisions. Dr. Julia Metz is an advisor at the German Parliament. She holds a doctoral degree from the Freie Universität Berlin and has previously worked as a senior researcher at the WZB Berlin Social Science Center and at the University of Bremen, Germany. Her work covers the areas of public administration and European governance, and has appeared in, among others, the Journal of European Integration and in Policy and Society. Boswell, C. (2009) The Political Uses of Expert Knowlegde: Immigration Policy and Social Research (Cambridge: Cambridge University Press). Dreger, J. (2014) The European Commission’s Energy and Climate Policy: A Climate for Expertise? (Basingstoke: Palgrave Macmillan). Hartlapp, M., J. Metz, and C. Rauh (2014) Which Policy for Europe? Power and Conflict inside the European Commission (Oxford: Oxford University Press). Rimkuté, D. and M. Haverland (2015) ‘How does the European Commission use scientific expertise? Results from a survey of scientific members of the Commission’s expert committees’, Comparative European Politics 13 (4): 430–449. This entry was posted in Politics & Public Policy, Publications & Events, Science & Technology, The EU and tagged expertise, research policy. Bookmark the permalink. Next: Are English Universities likely to stop having to comply with EU public procurement law?